The search terms were being shared with Apple in order to enable Spotlight's new capabilities, which include searching sources like the Mac App Store, Wikipedia, and the web. When you use Spotlight, your search queries, the Spotlight Suggestions you select, and related usage data will be sent to Apple. Search results found on your Mac will not be sent. If you have Location Services on your Mac turned on, when you make a search query to Spotlight the location of your Mac at that time will be sent to Apple. Searches for common words and phrases will be forwarded from Apple to Microsoft's Bing search engine. While Apple noted directly within Yosemite's Spotlight preferences that the search terms were collected only to improve Spotlight Searches and directed users to turn off Spotlight Suggestions and Bing Web searches in System Preferences if they didn't want their data uploaded, the issue still received quite a bit of attention over the course of the weekend, with one developer even uploading a Python script to prevent Apple from collecting data. Apple has now given a statement on Spotlight Suggestions to iMore, stating that the company is "absolutely committed" to protecting user privacy and that Spotlight Suggestions minimizes the information that's sent to Apple. "We are absolutely committed to protecting our users' privacy and have built privacy right into our products," Apple told iMore. "For Spotlight Suggestions we minimize the amount of information sent to Apple. Apple doesn't retain IP addresses from users' devices. Spotlight blurs the location on the device so it never sends an exact location to Apple. Spotlight doesn't use a persistent identifier, so a user's search history can't be created by Apple or anyone else. Apple devices only use a temporary anonymous session ID for a 15-minute period before the ID is discarded. "We also worked closely with Microsoft to protect our users' privacy. Apple forwards only commonly searched terms and only city-level location information to Bing. Microsoft does not store search queries or receive users' IP addresses. "You can also easily opt out of Spotlight Suggestions, Bing or Location Services for Spotlight." As Apple says in the statement that it gave to iMore, users that are concerned about their data being uploaded to Apple's servers can easily disable the new features by going to System Preferences --> Spotlight and unchecking both the boxes for "Spotlight Suggestions" and "Bing Web Searches." 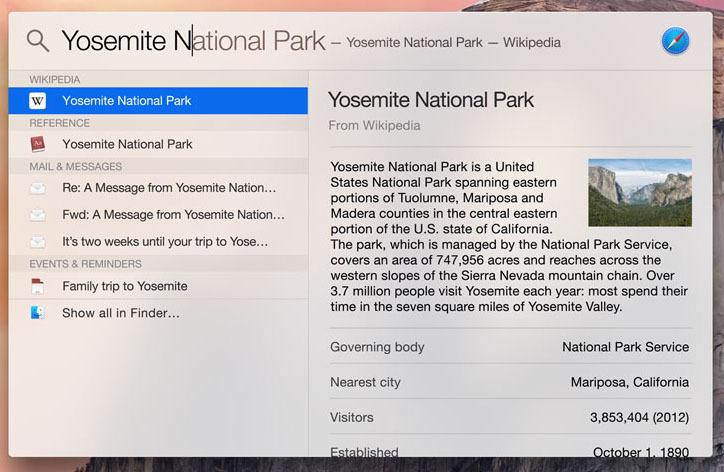 Introduced with iOS 8 and OS X Yosemite, Spotlight Suggestions allow Apple's Spotlight feature to give users search suggestions from sources like Wikipedia, the iTunes Store, and Maps. For example, it's now possible to search for an app in the Mac App Store using Spotlight, or look for a specific term on Wikipedia without needing to access Safari or another web browser. When we do ask to use your data, its to provide you with a better user experience. Our business model is very straightforward: We sell great products. We dont build a profile based on your email content or web browsing habits to sell to advertisers. We dont monetize the information you store on your iPhone or in iCloud. And we dont read your email or your messages to get information to market to you. Our software and services are designed to make our devices better. Plain and simple. That's a business model I like. Sounds like a lot of worry over a non-issue. Still, for all their pomp about privacy lately, they do show a similar behaviour like many others, i.e., enabling features by default, being a little obscure about those features and making the solution easy to overlook. It doesn’t matter to me so much whether Apple is in the business of collecting data or not, but once they do start procuring personal data, they should be frank about it and offer an easy and comprehensible way to opt out. Of course, the solution is pretty straightforward once you know that Spotlight does this. You just have to uncheck two options in Spotlight preferences. But on the other hand the term ‘Spotlight Suggestions’ isn’t very precise so you need to inform yourself a bit more (which doesn’t seem like a very good practice from a privacy standpoint). Where does Apple inform you about it? In a piece of text under Spotlight preferences, hidden under a separate button. In addition, Spotlight also transmits your location data whenever you search. To disable this, you actually have to look very carefully: it is within the privacy settings (System Preferences), under location services. There you have to scroll down to an item ‘System Services’ that has a separate but equally obscure button ‘Details…’. Only there can you prevent Spotlight from transmitting your location data. It's been this way on Google for years. Type pizza, and you'll get pizza places around you. Hmmmm.... How does that work? First thing I turned off in Yosemite. So many Little Snitch popups . . . Try to sign-in with your Gmail account and search "Pizza" in Google Chrome. It gives me the exactly feedback of locations of Pizza houses around me in my case. When I type something into Google, I expect it to be sent to Google. When I type it into a (formerly) local search tool on my computer, I do not. I think the inclusion of online sources in Spotlight should be an opt-in, not an opt-out. They could show a dialog box the first time you use it. Whenever your location data is accessed, an arrow will appear on the menubar, and it will stay there for at least 30 seconds or longer. If you have Yosemite installed and you'll know that. In fact, that is not true for Spotlight Suggestions, unless you have activated the obscure option "Show location icon in menu bar when System Services request your location" which is well hidden in the "Details" under Security&Privacy/Privacy/System Services and is turned off by default. I'll stick with snow leopard & ios 6 thank you. Anyone worried about this issue should most definitely not be using google. (as opposed to worrying about Apple).